This wave is for pros and elite age groupers. If your fast this is your chance to go head to head with others regardless of age. The minimum age to participate are as follows: Sprint Distance- 12yrs old, Quarter Distance- 14yrs old, Half Distance-16 yrs old. 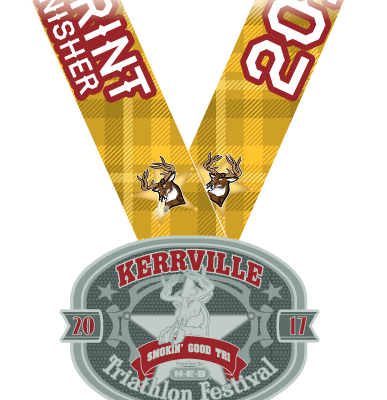 All finishers at the Kerrville Triathlon Festival will receive an official belt buckle Finisher Medal to commemorate their awesome achievement. These high-quality medals will look great hanging on a wall in your home or office or worn around town! An Overall Champion will be awarded for Male, Female, and Masters categories in all Distances. In the Half Distance, 2nd and 3rd place overall will be awarded in the Open Division. 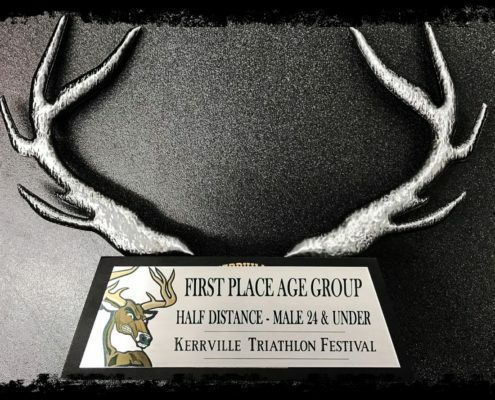 Age Group Awards will also be presented to the top 3 male and female in each age group, starting at 24 & Under and going to 75+ in 5 year increments. AquaBike awards will be presented to the top 3 male and female overall. Relay Awards are given to the top team in the male, female, and co-ed categories. Awards will be presented at the event or may be picked at a location TBD. Awards will not be mailed out.